You may have heard people talk about how good yogurt is for you because it contains probiotics. However there’s actually a variety of foods that are naturally fermented and contain these helpful organisms. When made at home, products like kimchi, certain pickles, kombucha, and even natural sodas are all chock full of probiotics. One of the easiest foods to ferment yourself is Sauerkraut. It’s great for gut health. The probiotics in sauerkraut helps keep your digestive system healthy. The fermentation process makes the vitamins and minerals in cabbage more accessible to your body. It’s good for your immune system. Many studies show having a healthy digestive system is important to having a healthy immune system. It’s a great way to preserve and use extra cabbage. It can last for months in the fridge or cold storage. It may help improve your mood. Some recent studies have led scientists to believe that there’s a connection between gut flora and a person’s mood. 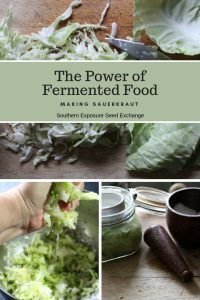 Eating fermented foods like sauerkraut may help you feel better physically and emotionally. Sauerkraut requires just 3 basic ingredients and there’s no fancy equipment needed! To begin rinse your cabbage and then set a few nice, whole cabbage leaves to the side (you’ll need one per jar). Then finely slice your cabbage. If you’re doing a lot of kraut you may want to use a mandolin vegetable slicer however I usually just use a knife. A lot of recipes call for a specific amount of cabbage but you can use as much as you’d like to make and adjust your salt to the amount of cabbage you’re using. You should use approximately 1 1/2 tsp of salt for every quart of kraut you’re making. 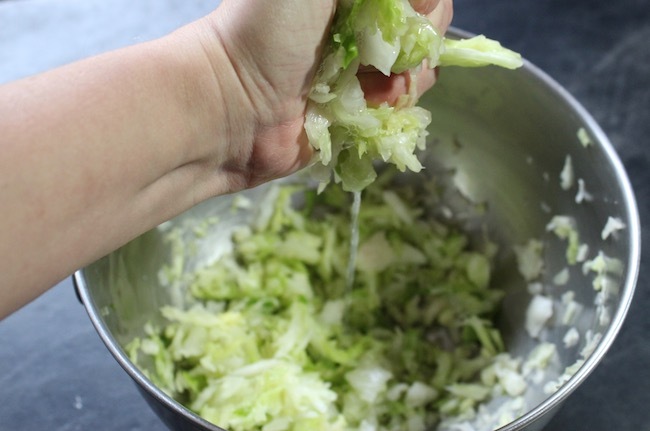 Once you’ve sliced your cabbage, place it in a mixing bowl. Slowly add the salt while squishing the salt and cabbage together with your hands. The cabbage will begin to look slippery and shiny. Eventually there should be a good bit of juice (called brine) in the bowl. You should be able to see it run out of a handful of cabbage when you squeeze it. If you taste your cabbage, it should be pretty salty but not disgustingly so. Then you can pack your cabbage into a clean jar. Start with a spoonful or handful at a time carefully packing each one into the jar to avoid any air pockets. You can use a clean spoon, your hand, a tamper, or a pestle. Leave at least an 1 1/2 inches of head space in your jar. 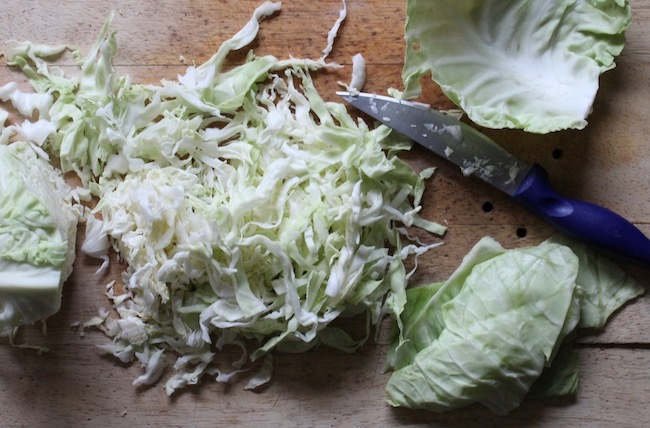 Use the cabbage leaf you set aside at the begin to cover the top of your kraut. You want all of your cabbage to be fully submerged. You can way your kraut down with a sterilized stone like I did for these pickles or if you have enough room you can use a little dish of water. You can also use a ziplock bag of water or a crock weight if you have one. 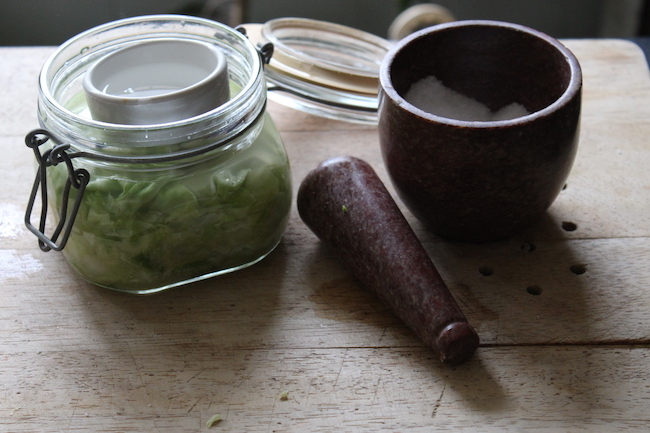 Place your jar or jars of kraut out of direct sunlight but somewhere you will remember to keep an eye on them. You kraut will need to ferment between 4-14 days. It will ferment faster in warmer temperatures. You should open your jar at least once per day to let out any gases that have built up. You don’t want your jar to explode. You may also need to pack the cabbage down if you notice any above the brine or any air pockets. If you notice a film on top of the brine you can just scrape it off. It won’t hurt you. You’ll know your kraut is finished when it is more yellow than green and translucent. It’s flavor will get more intense the longer it ferments so how long you leave it is up to you. Once it’s finished you can store it in the fridge or a cool root cellar to stop fermentation.